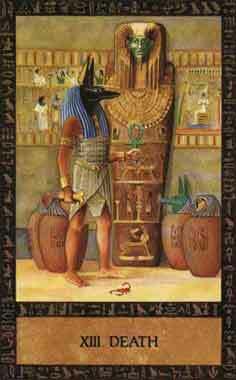 Anubis,the god depicted on this card,is the son of Nephthys and either Set or Osiris (the myths are uncertain on this point).He was the god of the dead for many years but when Osiris assumed that role,Anubis came to be seen as his assistant. He assisted Isis and Nephthys in the embalment of the body of Osiris.He was the god of the strip of land that lay between the rich cultivated soil of Osiris and the sterile desert of Set.He was the ruler of the Necropolis.Tying his belt is the knot known as the Tet,or the blood of Isis.His cuirass is made of fish-like scales of iron. The god holds an Ankh which is green,the color of resurrection.In his right hand he holds the sacred Peseshkef,a fish tailed implement used to open the mouth of the deceased. The Opening of the Mouth ceremony was thought to magically restore to the mummy the full use of his senses,thus preparing the decreased for the life to come in the Underworld.. 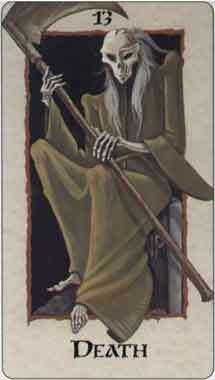 There may be a change of personality,possibly a complete change in one's way of life or circumstances.There is a new and brighter view of the future.In general the changes indicated by this card will be for the better.